If you read the research reports from various grass institutes, the number of cultivars of grass species will astonish you. When you add in the numerous characteristics of each grass, and how each grows under different conditions, the task of selecting the best for your location and intended use can seem daunting. In addition, with ongoing research, there are always new and improved cultivars. Avoid confusion by contacting your Cooperative Extension Service (CSREES)and speaking with a turfgrass specialist. Other excellent resources are the National Turfgrass Evaluation Program (NTEP) and the Guelph Turfgrass Institute in Ontario, Canada. See the Links to Learning page for more information. If you choose to do your own research, start by using the Plant Hardiness Maps to find your zone. A grass that is right for Vermont may not fare well in Texas. You can also read more about the best cultivars for warm-season grasses versus cool-season grasses. Whether they are appropriate choices for your lawn depends on the growing environment where you live. 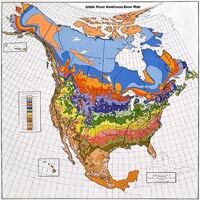 USDA Plant Hardiness Map – Click image for more information. The USDA Plant Hardiness Map divides the United States into 11 zones according to average minimum winter temperatures. Hardiness zones identify regions to which grasses are suited based on their cold tolerance. Many factors, such as elevation and moisture level come into play when determining whether a grass is suitable for your region. Local climates may vary from the map. Contact your local Cooperative Extension Service (CSREES) for seed recommendations for your area. Canada’s Plant Hardiness Map outlines the different zones in Canada where various types of grasses will most likely survive. Based on the average climatic conditions of each area, the hardiness map is divided into nine major zones: the harshest is 0 and the mildest is 8. Relatively few plants are suited to zone 0. Subzones are also noted in the map legend, with 4a, 4b, 5a, and 5b, the most familiar to Canadian gardeners. Some significant local factors, such as micro-topography, amount of shelter, and subtle local variations in snow cover, are too small to show on the map. Year-to-year variations in weather and gardening techniques can also have an impact on plant survival in any particular area. The American Horticultural Society (AHS) Heat-Zone Map divides the United States into 12 zones based on the average annual number of days a region’s temperatures climb above 86 degrees Fahrenheit. Above 86 degrees, the cellular proteins of plants begin to experience injury. Introduced in 1998, the map is especially helpful for gardeners in southern and transitional zones. Nurseries, growers, and other plant sources list both cold hardiness and heat tolerance zones for grass plants. Using the USDA Plant Hardiness Map, which can help determine a plant’s cold tolerance and the AHS Heat-Zone Map gardeners can safely choose grasses that tolerate their region’s lowest and highest temperatures.